After making the pumpkin dish for dinner yesterday, I had to clean out and cook up the rest of the pumpkin last night. I pressure cooked the flesh and will freeze it for pumpkin pies at Thanksgiving. 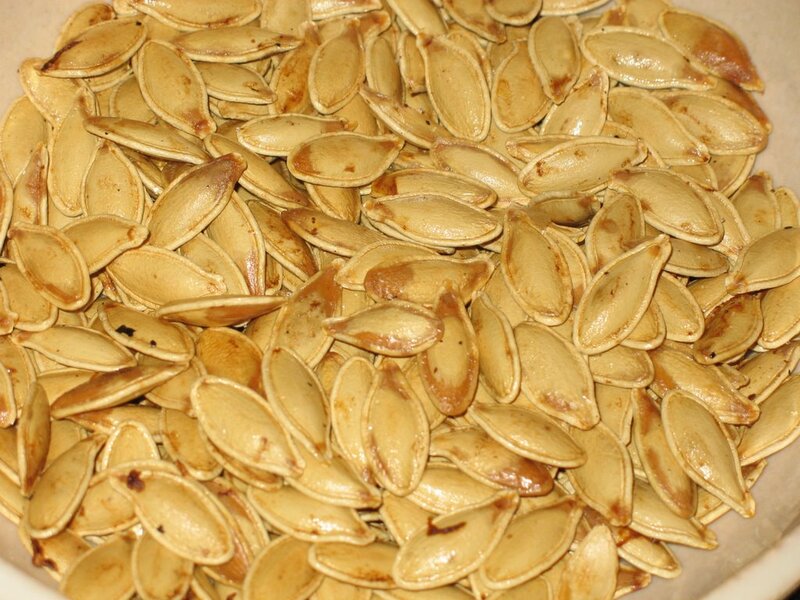 Then I cleaned off the seeds and roasted them with a little bit of salt... YUM! I know that some people use more interesting spices, but I didn't know what to do, so I just resorted to the basic salt. Anyone have any other cool pumpkin seed ideas? My mom is in Japan for a week, so tonight we had my dad over for dinner. I made the "Squash, Fennel and Apple Soup" from the "Voluptuous Vegan" cookbook. My cousin Eliza gave me that cookbook a while back, and I was a little intimidated by it at the time... but I started looking through it and saw some nice looking recipes! So I've got one or two more coming this week. 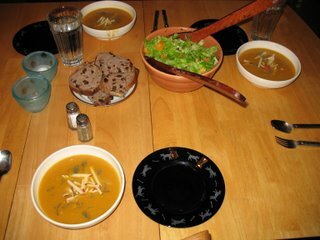 This soup was very easy and very, very delicious. Highly recommended, indeed! Apple matchsticks and chopped sage for garnish were really great. 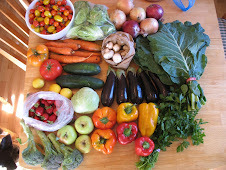 Best of all, the apples, the sage, and the butternut squash were all from our own garden! cool! Along with soup we had a nice bright salad (orange tomato, orange bell pepper, carrot... very orange! ), and some delicious "Raisin Nut Rye" bread from our amazing local bakery, Gayles. Yumola. 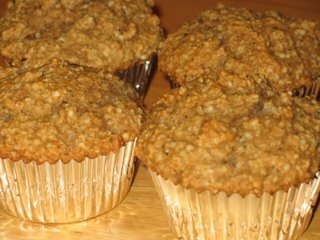 Last, but not least, this afternoon I made some "Apple Hemp Muffins" from "Vive Le Vegan"... it may not be the best picture ever, but the muffins are great! I got the idea from Deirdre Jean over at the Flickr Vegan Baking Pool... I used my own homegrown apple sauce, reduced the oil to 2 T, and added in some wheat bran for a little more fiber. They are really good! I know what you mean about being a bit intimidated by the voluptuous Vegan cook book.. I too have had it for quite a while and the only thing I have made from it was the thai vegetable stew.. which by the way was TO DIE FOR!! there are just so many recipes in it that look good, but my little ones aren't quite ready for.. or would just snubb. The soup looks good maybe I should try that one? 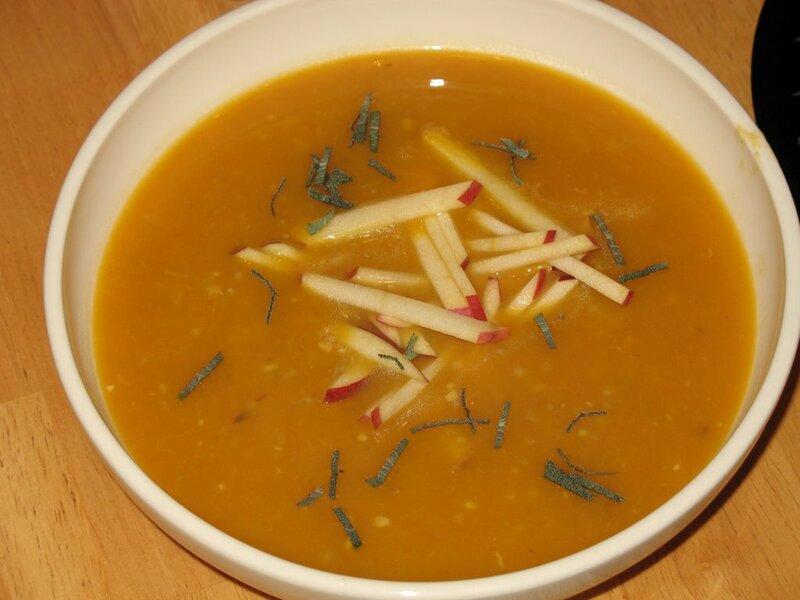 Your squash, fennel and apple soup sounds similar to the soup I made this weekend. I really enjoyed the flavors together but Marty wasn't a big fan. Too bad for him - more for me! 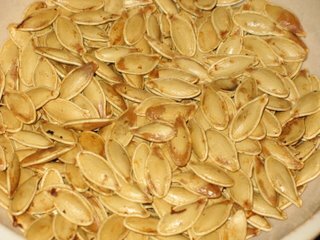 Yeah, I also love pumpkin seeds with just a touch of salt... yum! Funny about that cookbook isn't it? Some cookbooks just seem so inviting, and others seem so stand-off-ish. Hmm. Maybe I'll try that Thai Veg Stew though, thanks for the tip! 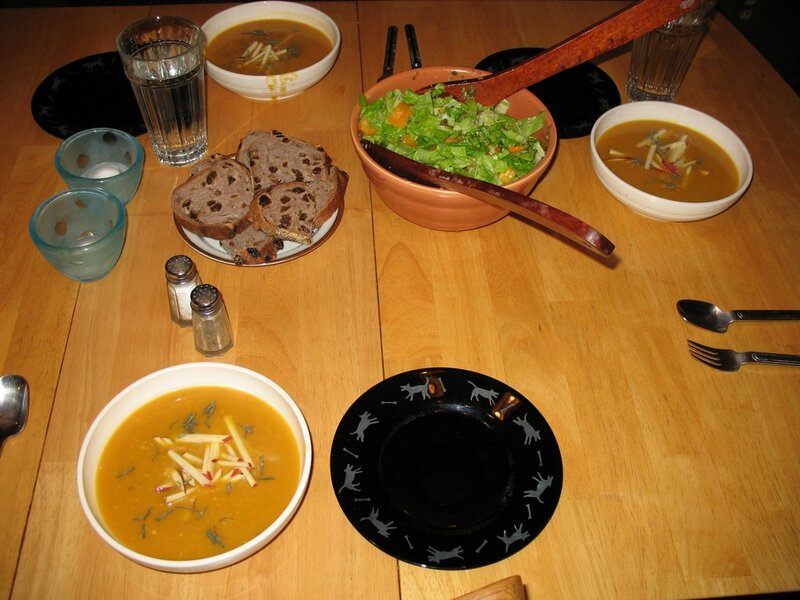 Our soups do indeed look similar! My boyfriend Musty usually eats so much... particularly if he likes something. So, every once in a while I'll make something that he doesn't like, and there is always SO MUCH left over. It takes a monumental effort for me to finish it all! By the way, I've always *really* wanted to get into yoga but have found it spendy or intimidating (or both!) Do you have any suggestions?? Yeah, yoga can be a bit pricey, depending on where you live. It can also be intimidating, regardless of where you live! As far as the pricey issue... There are a few possibilities. I don't know how many studios or classes there are in Bozeman, but it would be worth asking around to see who has the cheapest rates. Some places/teachers will let you do a work exchange (like if you put up posters or clean the studio you can take classes for free/cheap). That would be worth asking about. Community colleges often have inexpensive yoga classes... as well as Parks & Rec programs. All that said, the quality of the instructor is *extrememly* important... so don't sacrifice that for a few dollars here or there. For me, yoga has been a transformational force of tremendous benevolence. I have been studying yoga for about 11 years now. It has given me more health, courage, compassion, patience, strength, direction, dedication, and optimism than I ever imagined possible. I spend a fair amount of money on classes with my teacher, and I haven't ever regretted it. Based on my experience I would really encourage you to find a teacher that you like and take some classes with him or her... until you get the hang of things. Then you could practice at home &/or with a video/CD most of the time, and just go to class a couple times a month to make sure you are doing things properly. A teacher's advice for that is very beneficial. As far as being intimidating... the best thing I can say is that you are not alone! Anyone else in the class for the first time will also be intimidated, and everyone else in the room will remember what it felt like the first time they did yoga! Yoga requires a lot of courage and effort, but it gives a lot in return. So, I would say, give it a shot and see what you think. Also, there are so many kinds of yoga, and even withing the same style - each teacher lends something unique. I would say that even if you don't love your first class, shop around and see if you can find a class that resonates with you. Your yoga teacher doesn't need to be your new best friend, but you should feel comfortable taking advice from him or her and also you should feel that he or she is deserving of your respect & attention. Let me know if you have any more questions, I love to talk about yoga! 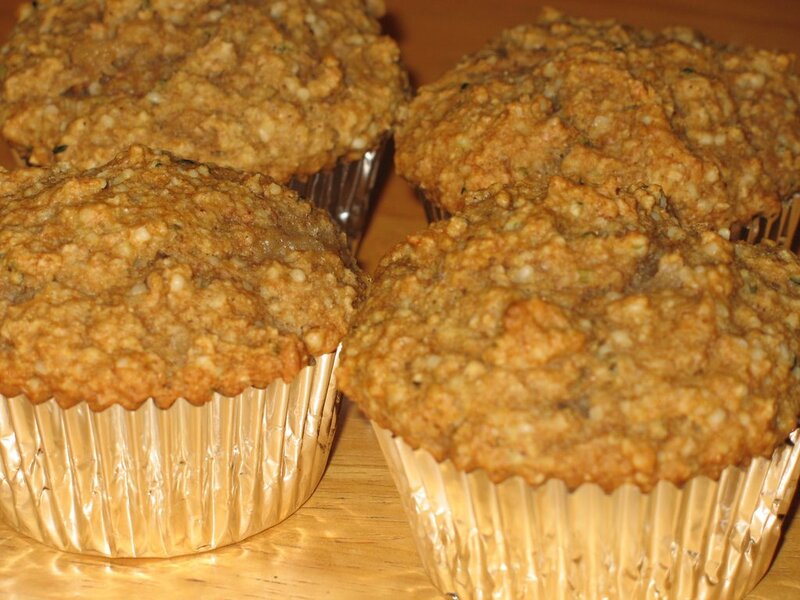 Those apple hemp muffins are SO good. I love how you substitute to make them even healthier! Lately I am trying to reduce the amount of oil I use in cooking... so I am experimenting with some healthier tasty treats. I am SO making those muffins. I'm right now requesting that book from my library again!